A Homestead Tax Exemption potentially reduces the amount of property taxes owed on a property. To qualify, applicants must occupy the home by January 1 of the taxing year. The homestead exemption may extend to the home and up to 20 acres of land used for a purpose related to the residential use of the homestead. 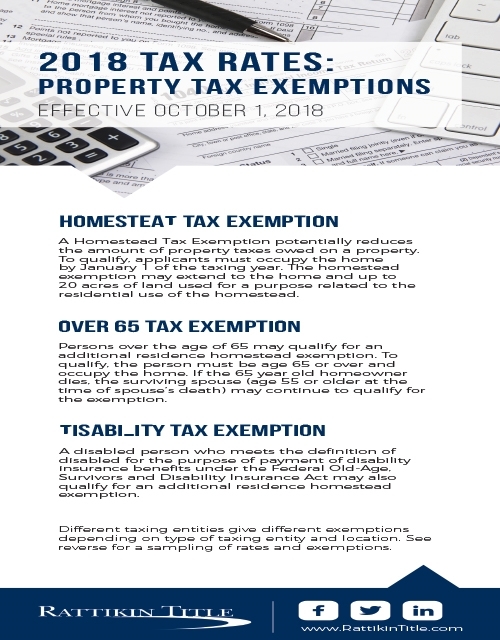 Persons over the age of 65 may qualify for an additional residence homestead exemption. To qualify, the person must be age 65 or over and occupy the home. If the 65 year old homeowner dies, the surviving spouse (age 55 or older at the time of spouse’s death) may continue to qualify for the exemption. A disabled person who meets the definition of disabled for the purpose of payment of disability insurance benefits under the Federal Old-Age, Survivors and Disability Insurance Act may also qualify for an additional residence homestead exemption. Different taxing entities give different exemptions depending on type of taxing entity and location. See second page of download to the right for a sampling of rates and exemptions.